Details:The Southern Bridge (Latvian: Dienvidu tilts) is a bridge that crosses the Daugava river in Riga, the capital of Latvia . The bridge was constructed between 2004 and 2008. It was opened on November 17, 2008. Meanwhile, construction of all the access roads is planned to last until 2012.This mini sheet shows the Southern Bridge in Riga,It is constructed through the river Daugava(Zapadnaya Divna-West Divna). 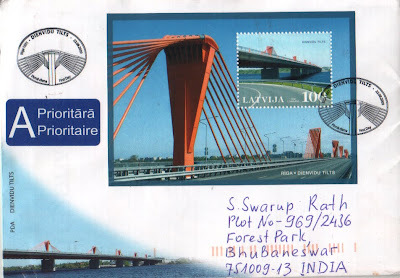 On the stamp it shows from right cost on left and on the full mini sheet from left to right coast.The bridge is put on operation in 2008.My friends notice that the design of the bridge is very similar to the project which has been developed during Soviet times.The project did in Leningrad.Now this city refers to as 100 years ago St-Petersburg. Remark:Excellent mini sheet FDC posted on the issue date by my friend Evgenii,Many many thanks for the nice write up.Very Clear bridge cancellation on the FDC.